This Honey Bunches Of Oats has bigger, better bunches. If you like original Honey Bunches Of Oats (now called Honey Roasted Honey Bunches of Oats), you'll like this new cereal. They taste nearly identical. While the pecans in this new version are easy to identify when the cereal is eaten dry, the pecan flavor gets somehow lost in milk. The taste of pecan becomes more of a general "nutty" flavor once all the flavors meld. If you really concentrate, you'll probably sense that this version has a tinge more granola flavor than it's predecessor. The great surprise from Honey Bunches Of Oats with Pecan Bunches isn't the flavor, it's the texture. The bunches (often called "clusters") are lighter, larger and provide a bigger crunch. Don't expect the Grape-Nuts-esque concentrated clusters you find in Post's Just Bunches cereal. These bunches are less condensed - in a way, almost fragile. The crunch doesn't come from biting into a hard substance, it comes from the collapse of the cluster structure. To make a zen-style parallel that's completely unfair to Just Bunches cereal: hammer crushing nut makes big crunch; hand crushing paper makes big crunch more easy. 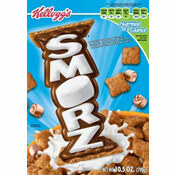 I have to agree with the cereal company on this product. You'll like this cereal and "one spoonful is all it takes!" 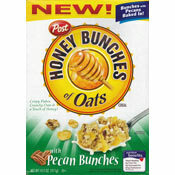 What do you think of Honey Bunches Of Oats with Pecan Bunches? This is my favorite cereal! I could just eat bowls of it like crazy. I think people will really enjoy it. Uber love this!! :D I mix it with Post Selects Blueberry Morning and makes it ever better. I really really miss Honey Bunches of Oats with Bananas. It was the best of the brand and its gone. I like the one with Peaches, but sometimes it's hard to find. I really liked this cereal too. But I agree with Mr Breakfast. It's like an improved version of the original - but with bigger and better clusters.